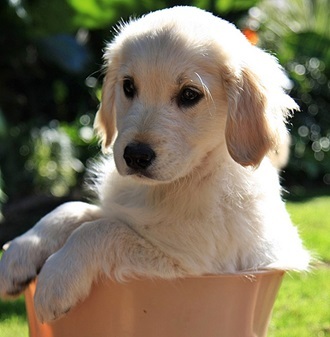 Photo of Labrador Retriever puppy by jennuconr. Proper socialization is extremely important if you'd like to live with a well-behaved and friendly companion. Socialise your puppy as much as possible from an early age. Take it to a puppy school or a dog obedience school. People can hardly become amicable without socialization; the same goes for dogs and puppies. Do not ever leave your children with your dog alone. A dog's behaviour can be unpredictable even if you think you know your dog well. Moreover, teach your children to be respectful to the dog and other animals. Stop any fight or tug-of-war games - they are not appropriate for dogs and may cause unexpected aggression. When your children play loud games or run around, make sure the dog is out of their way: sometimes dogs can get over-excited or frightened when there is too much noise. Even if your dog is extremely friendly with visitors, jumping on them may annoy some people and frighten some children. Good manners are always necessary! Train your dog to sit before you let the visitors stroke it. Some dogs do not like to be stroked or cuddled. For your own safety, always remember about this, and ask the dog's owner before you act. If he says it's okay, let the dog sniff your hand first, and do not make abrupt movements because it may frighten the animal. If it has nothing against petting, it will sniff your hand and move towards you. Stroke it under the chin but not on the head (some dogs can interpret the latter as a possible threat). If the dog moves back and tries to avoid your hand, this is a sign it does not want to be petted. When you train a dog, patience is the key. Losing your temper will only confuse the pet, and it will hardly understand what you want. Do not forget to reward: when the dog has done something you wanted it to do, reward it profusely. Try to never respond to any unwanted behaviour of your dog when it seeks attention, otherwise your dog will learn a quick way to manipulate you. If the dog scratches the door to come in, do not open it right away. Wait till it stops scratching, then ask it to sit, and only then open the door. This approach is good to prevent many unwanted habits: ask your dog to perform a task and, after it has done that, give it what it wants (attention in this case). This reinforces your pack leader position. 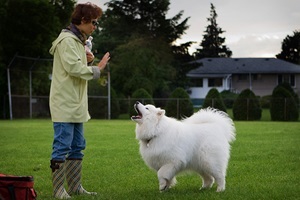 Photo of Samoyed by Timpy. The more you do this, the more you teach the dog begging is allowed and rewarded. Command your dog to sit or lay when the family is eating. When you give the dog its meal, ask it to sit first. It reinforces your leading position and saves you from troubles with putting the bowls on the floor. Don't distract a dog when it is eating. Let a dog eat peacefully. A sudden touch can scare a dog. Scared and frightened dogs may bite. Provide your dog with its own comfortable bed or crate in a peaceful corner. Don't let your dog sleep or lay in your bed unless you invite it to. Just like children, dogs have energy to burn off. If they are not provided with proper physical and mental work, they can become unruly. Simple feeding and housing a pet is not enough. Attention and quality time-spending is also necessary. Besides, practice makes perfect if you really want to train your dog well. Violence can hardly be called an effective way of training. It may break the dog's spirit, not to mention it's simply inhumane. Violence creates more violence, so if you do not want violent streaks in your dog, do not use violence.